Bar Faucet. one or three-hole installation. 1/two in. IPS inlets. 9-7/16 in. spout height. 7-1/four in. aerator clearance. five-7/8 in. spout reach. 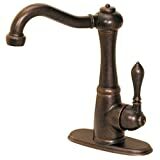 Consists of optional cover plate and lever handle.